After an 18-month research process, Concordia revealed earlier this year its unique brand promise which solidifies what it means to be a Concordian. Published May 17, 2018 at 8:00 a.m.
As an accounting major and a self-proclaimed lover of all things organization, Concordia University Wisconsin senior Nate Hasenstein knows down to the cent how much he has in his bank account. He makes his bed every morning (or else he can't concentrate in class) and he's not ashamed to say that he has some OCD tendencies. But even Nate couldn't count on his life going the way he had planned. During his junior year of high school, Nate's mom passed away from cancer, forcing him to make a pivotal life decision without the input of one of his greatest influences. Initially, Nate chose to go to a school in Michigan that specialized in professional golf management, but less than a week in, he knew the school wasn't a good fit. So he changed directions and enrolled at Concordia. 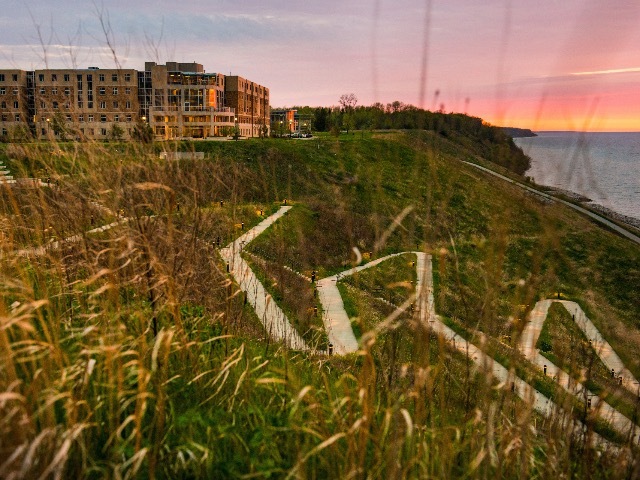 A feature of Concordia University Wisconsin's Mequon campus is its 200 acres overlooking the beautiful Lake Michigan shoreline. Once at Concordia, Nate met Zoey, the university's on-campus comfort dog with whom Nate quickly developed a special bond. At first, it was difficult for Nate to open up about his mom's passing, but Zoey helped him through the healing process and even opened doors for Nate to become a confidant to others who were struggling. While the circumstances of Nate's life may be unique to most, his response to them bonds him to the hundreds of thousands of other Concordians, both past and present, who have clung to faith in times of trouble. Instead of letting hardships overcome them, they have tapped into an uncommon hope and a determination to bring about good for themselves and for others. 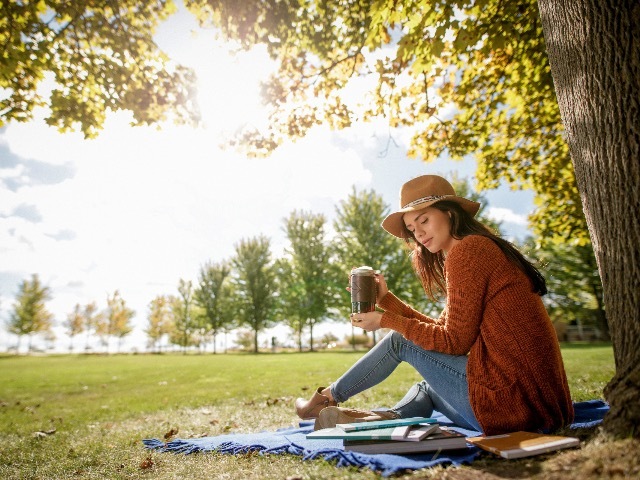 This shared Concordia persona was solidified through an 18-month brand research process, which was led by Senior Vice President of Strategy and University Affairs Gretchen Jameson and supported by Milwaukee-area marketing agency BVK. The discovery process brought the university – with its nine educational centers, online offerings, and residential campuses in Mequon and Ann Arbor – to a simple phrase with layers of depth and meaning behind it: Concordia University. Live Uncommon. Earlier this year, Concordia rallied around the discovery by launching a new website and brand platform that unites the university and compellingly communicates to the world what it means to be a Concordian. "There is something quite different about Concordia University," says University President Rev. Patrick T. Ferry, PhD. "What sets us apart, what makes us uncommon, is that our ordinary university is attached to the Word of God and connected to His promises. Our assurance of eternal life through our Savior compels us to go out into the world, utilizing the gifts with which he has graced us, to share the extraordinary." That's exactly what Nate ended up doing. Four years into his time at CUW, the connection Nate shares with Zoey has allowed him to step into an unexpected role of comforting others. Nate now regularly takes Zoey to Columbia St. Mary's hospital to work with their behavioral health patients. "There's a spirituality to working with Zoey," Nate explains. "Whenever you bring Zoey into the group, the patients start petting her and then opening up or crying. Some of them are getting out of bed for the first time in weeks." As it turns out, the unanticipated change of direction from a university in Michigan to Concordia has been what Nate needed all along, even if it wasn't part of his original 10-year plan. "I knew I needed to be at Concordia because of the faith base," Nate says. "I saw people come out a better person, ready to take on the world, and set on the right paths with the right people. That's why I decided to switch to Concordia, and this time, it was the perfect fit." Learn more about Concordia University at www.cuw.edu and read more stories about Uncommon Concordians here.